Magnetic Control: Magneto is a supremely powerful mutant capable of manipulating and channelling magnetic fields, even to the point of tapping into the electro-magnetic spectrum of the Earth itself. He can manipulate iron and iron-based alloys to his whim. He can assemble complex machinery, explode most metal constructs, and manipulate ferrous objects with nearly unlimited range. He can create force fields of unearthly strength, stopping nearly all physical and energy attacks. He can also fly under this own power. Magneto can also detect movement within magnetic lines of force and can their fore detect teleporting and invisible opponents. Energy Control: To some extent Magneto can control other forms of energy such as: heat, light, ultraviolet, gamma radiations, and even gravitons. Telepathy: Magneto has a limited telepathic ability with which he can project his thoughts into others minds. Astral Projection: Magneto is able to enter the astral plain with limited ability. Body Armour: Magneto’s ferrous costume provides him with some protection from physical damage. Magneto has concealed the facts about his early life and true identity. It is known, however, that he and his family were in Germany during the Nazi regime and were sent to the Auschwitz concentration camp in Poland and possibly others. Magneto (Prisoner 214782) was the only member of his family to survive them. This experience harshly demonstrated to Magneto how inhumane a majority could be towards a minority, a lesson he would remember when he discovered that he was a mutant. After abandoning his search for Magda, Magneto arrived in the newly independent nation of Israel. While working at a psychiatric hospital near Haifa, Magneto met Charles Xavier, who became his friend. Together they prevented Baron Wolfgang Strucker and his HYDRA agents from obtaining a large cache of Nazi gold. Magneto used his powers to take the gold himself. It is presumably around this time that Magneto created another identity for himself as Erik Magnus Lensherr, with the help of a master forger living in Israel. By the time Xavier founded the mutant team X-men, in part to combat mutants who threatened humanity, Magneto had decided that the only way to safeguard superhuman mutants from persecution was for mutants to conquer human civilization. 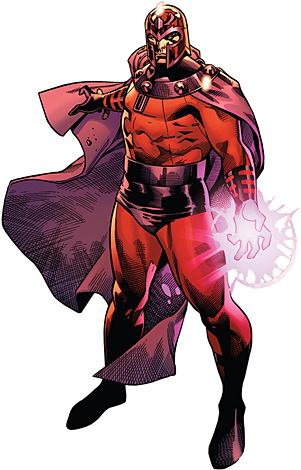 Magneto, now using this particular alias and garbed in his familiar costume, attacked an American missile base, which led him into his first clash with the X-Men.